An immigrant from Mexico testified Thursday that he was the subject of five traffic stops in a one-year period by a former Suffolk County police sergeant who is charged with stealing money after targeting motorists he believed were Hispanic. “I remember him because he stopped me so many times,” Eligio Solano, 41, said after pointing out former Sgt. 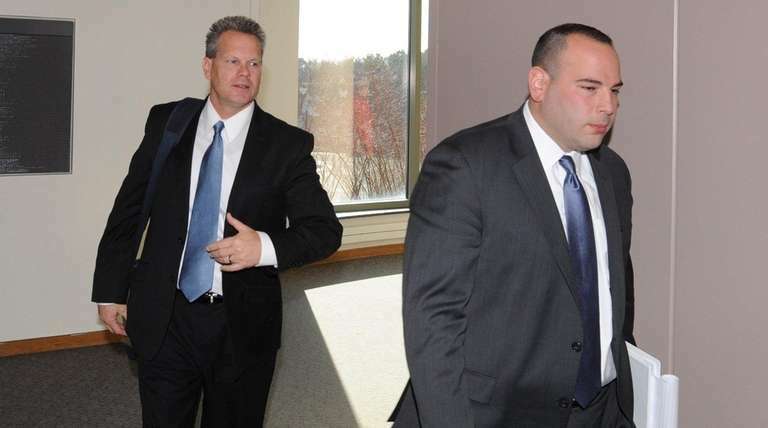 Scott Greene at the defense table in Suffolk County Court in Central Islip. The stops occurred in the Brookhaven area between the summer of 2012 and the end of 2013, he said, and $150 was missing from his wallet after Greene examined it during the first of those stops. Judge Fernando Camacho had initially allowed Solano to testify only about the single traffic stop during his direct testimony when he answered questions from Assistant District Attorney Melissa Bliss. However, Solano appeared flustered about dates and details when cross-examined by defense attorney Scott Gross of Garden City. The jury was then brought back in and Solano was allowed to give limited testimony about the additional four stops. Solano, a construction worker who came here from Mexico 27 years ago, said he knew he had $750 in his wallet when he was stopped the first time because he had just gotten paid $150 a day for five days work and had seven $100 bills and one $50 bill in his wallet. When he checked later, a $100 bill and the $50 bill were missing, he said. Like most other witnesses who said they were victimized by Greene, he said he did not report the loss to authorities. He did tell the contractor he worked for, but the man got angry, he said. “He told me police do not do that. I was afraid and I didn’t want to tell anybody,” he said. Two other men who testified Thursday were passengers in vehicles that were stopped by Greene and said they were missing money after he searched them. All the men who testified had Hispanic surnames and were driving vehicles with out-of-state license plates. Prosecutors said Greene targeted those vehicles because he thought the occupants would not report him to authorities. Greene was arrested on Jan 30, 2014, the date police and prosecutors snared him in a sting with an undercover investigator posing as a day laborer. Gross argued to the jury in his opening statement that county officials then went looking for other victims in an attempt to show federal officials they were serious about enforcing a consent decree that stemmed from allegations the county police discriminated in the policing of Hispanics. The defense attorney said prosecutors have filed visa applications to get immigration papers for some witnesses and dropped pending criminal cases against some in an effort to gain their pro-prosecution testimony. He also said several of the witnesses had a financial interest in a conviction because they are among a group of Hispanic people who have sued the county for monetary damages on the grounds that they were targeted — by Greene and other officers — for traffic stops because of their ethnicity.